But in the world of specialist Hi-Fi there are few big beasts to stifle innovation and yet here too the forces of conservatism, and lets face it, idleness, mean that it's hard to think of more than a handful of truly innovative products produced over the last 30 years. I can see this turning into a bit of a rant, so I'll cut it all short there, but it is also true that it's often new companies, full of enthusiasm and commitment that break through with new products. Which takes us back to 1975 and the new company Dynavector. Started by a Dr Tominari, its first innovation was one of production techniques with a new winding machine reducing the costs of one of the world's first high-output MC cartridges. But that was just a taster for what was to come because soon afterwards Dynavector produced a totally off-the-wall tonearm in the 505, unlike anything that had gone before. 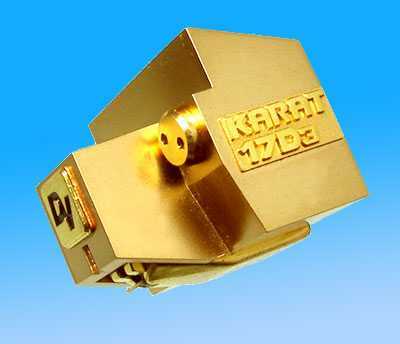 And at much the same time a new cartridge range came out - the famous 'Karats'. 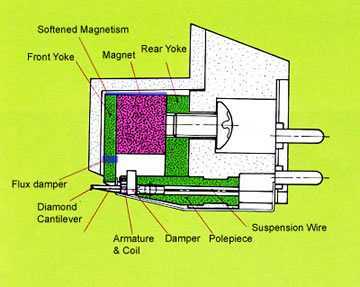 What made these special was that unlike any cartridge before or since they used a tiny, 1.3-1.7 mm solid diamond cantilever - the argument (called Dispersion Theory) being that such a cantilever would be much stiffer and thus store far less energy than a conventional alloy tube used by everyone else. Now nearly 30 years later Dynavector is a long established and mature company, still making cartridges at most price points from "poor-enthusiast" to "well-heeled-obsessive", and though distinctive and very well regarded, nothing is as original and unique as those early products. But in Dynavector's catalogue remain two survivors from that first flush of youth - the Dynavector 507 tonearm, which is an updated 505, and the last 'Karat' - the 17D3. Living up to its name the D17 is a real jewel of a cartridge. It's tiny, very shiny, and has the look of something much more expensive than it is... The size could be an issue for some as it is noticeably shallower than most (including all other Dynavectors), and like that other 'old timer' the Audiotechnica AT33e, may need a headshell spacer to get it level if your arm doesn't go low enough. At only 5.3 grms it's very light, another clue to its age, and as a medium-compliance device it should be pretty compatible with most arms. For example the very low weight helped the highish effective-mass Opera ST600 behave itself. The unconventional bit is of course that 1.7mm long, solid-diamond-rod cantilever. I suspect that this is the same as the blank rod styli are ground from, but don't quote me. Glued to this is the "Micro-ridge" line-contact stylus. As well as the very short stiff cantilever I wonder if the mating of diamond with diamond is significant in the sound with regard to acoustic impedance? With such a short cantilever the rest of the internals have to be pretty unconventional, as you can see from the cutaway, but the tiny movements that cantilever produces still manage to produce a healthy 0.3 mv - decent low-output MC territory. As mentioned above the cartridge was easy to align and despite its unconventional design it proved extremely easy to use and totally vice free. I have seen comments that because of the very small clearance, the slightest fluff will lift it off the record. I have to disagree. My house is very dusty and if a ball of fluff develops between the stylus and cantilever it'll lift the cartridge, just like every other cartridge in the house, but no worse, the short cantilever is immaterial. Tracking was very good, never causing problems with any record, and the cartridge was equally happy on the three arms I tried it with, the air-bearing Conductor, the unipivot Opera ST600 and the bonkers 507 - so fussy it ain't. I did play with both VTA and VTF and found the latter to be the more critical, in my cold room 2.2 grms being the figure I settled on with the ST600, 2.00 grms on the much lower effective-mass 507. I'm not sure quite what I expected when I first put on the cartridge. It's easy to look at a design and predict in your head what it should sound like (not a good thing to do as a reviewer) but the D17 is so unusual, normal points of reference are worthless. As usual I slapped on various pieces of vinyl as background for when I'm reading, just to break it in and for me to get accustomed to the balance. That my reading kept getting interrupted, and for positive reasons, shows that if nothing else the D17 isn't boring or run-of-the-mill. Over the next few evenings I began to understand its strengths and weaknesses and also to see why after 25 years Dynavector still have a 'Karat' in their line-up. I guess it's pertinent to look at what the D17 doesn't do first. Compared to the more conventional and hugely expensive Dynavector DRT-1s the sound can seem a little grey, lacking in the fantastic tonal shading that the flagship manages so well. Likewise the DRT-1s puts in a dynamic performance, both micro and macro that remains unbeaten here. The soundstaging also lacks the sheer size and scale of the big Dynavector, the image being trapped within the bounds of the speakers. An example of this. 'Time' from Bowies 'Aladdin Sane'. When Bowie sings "Time - she flexes like a whore" - etc, there is huge atmosphere and echo all around the word "Time". This is repeated for each use of the word. After the first bridge the trick is repeated with the word "You". At that third "You" Bowie leaps out of that ambience, out from between the speakers into the room and points at you. It's fabulous theatre and wonderful production. The DRT-1s makes you jump back in your seat. With the D17 you hear the effect but you don't need to change your underwear afterwards. I know this sounds like typical criticism of a mid-price cartridge against a real exotic and that it'll make a D17 owner (and owners of other cartridges) lust for The Big One. But I wanted to emphasise this essential difference because in just about every other respect the D17 is a superb cartridge. By more realistic measures, cartridges in its own price range, both soundstaging and dynamics are pretty good, though both the cheaper Shure V15 and Dynavector DV-20x do better at the latter; but even in absolute, money-no-object terms, the control and detail retrieval are top class. In the ST600 for example I think it bettered the DRT-1s, only in the 507 did the top Dynavector keep up. It's ability to separate strands of music, from top to bottom of the frequency range, such as the seamless portrayal of orchestral climaxes, was truly excellent. I found myself putting on all sorts of workouts, from Madonna's "Confessions" to some rousing big-band from King James just to play follow-the-instrument. Bass in particular was handled very well, and though I've heard deeper I've not heard tighter. The other outstanding characteristic is terrific speed, leading edges being instantly picked out in time and driving the music forward without the harshness that is sometimes the payoff. Compared to some the result is a little controlled, lacking in air and perhaps even "sat-on" but we're in the area where we start discussing what is correct, and personal preference, rather than anything that could be labelled as a fault. It's not got the Audio Technica AT9 edge-of-the-seat quality, nor the strict neutrality of the Ortofon Supreme, and there is a hint of warmth to the whole presentation perhaps caused by a slight shyness at the very top end. If I were pressed to make comparisons I'd say it was nearest to the Music Maker Mk111 in its detail and control, but with a hint more "soul" and less treble extension. As always I struggle with vocabulary to describe another cartridge, devices which by their very nature are often the most characterful in the musical chain, and wholly dependent on the arm and turntable that they are used with. In the end I came away from the Karat with a feeling that for all its uniqueness in design, we have here a cartridge which is widely compatible, with no real faults at the price and some strengths that match cartridges well into the silly money end of the spectrum. If you are looking for a quality cartridge that looks the part (unlike the Music Maker) and yet won't break the bank then it's a safe choice.